Released on Halloween, the 96 page, full color publication is now available at the Fall River Historical Society, Ebay, by Paypal, personal check, or money order via snail mail. Postage by Priority mail within the continental United States will be $5.95. The publication is priced at $30.00. The Paypal Send Money address is Revdma@aol.com, the total with Priority mailing postage is $35.95 for shipping within the continental United States. Via snail mail, please send checks or postal money orders in the same amount to: Shelley Dziedzic, P.O. Box 86, North Stonington, CT 06359. Personal checks made out to Shelley Dziedzic will need to clear before shipping. Shipping to Canada or outside the United States will be determined by the seller. Please contact Revdma@aol.com for those shipping costs. 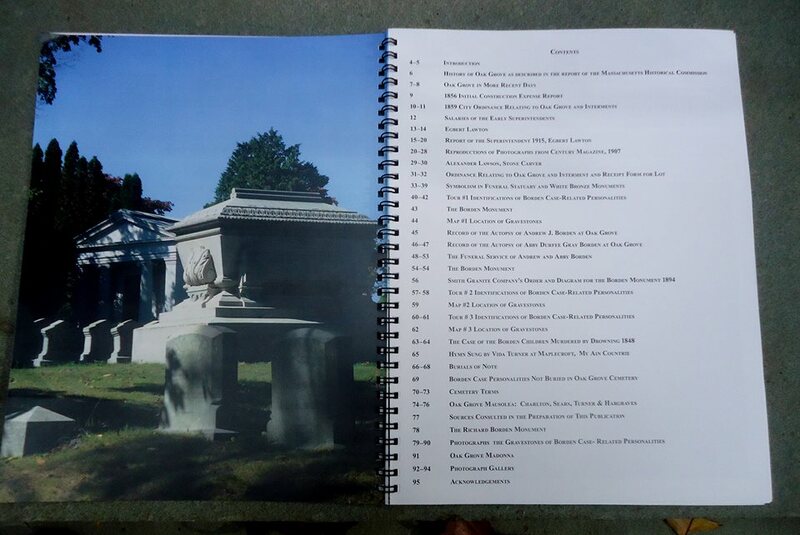 The publication features 3 cemetery walking tours with bios and maps of Borden case-related graves, Victorian mourning customs, a glossary of cemetery terms, other famous burials, information on the Borden autopsies and funerals, and a history of the cemetery. 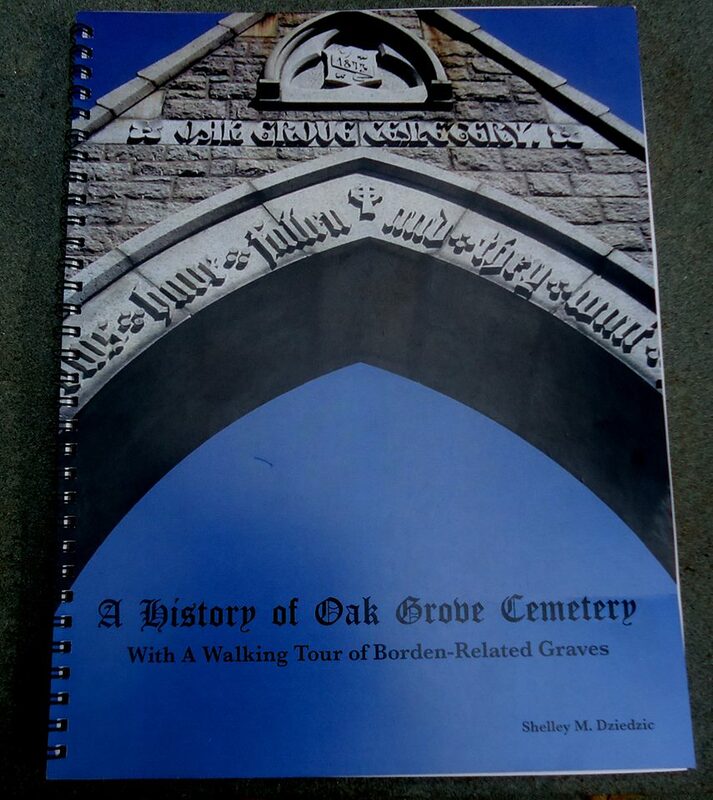 History Underfoot III Tour – The Fall River Garden Club, Fall River Historical Society and The Little Theatre of Fall River, Inc. will be hosting their 3rd tour of this historic cemetery, sponsored in part by Citizens-Union Savings Bank. The group has graciously agreed to donate a portion of their profits toward the purchase of a Memorial Tree. F.O.G .has been invited to provide an informational table on our group and the work we are doing to restore Oak Grove. Past tours have been a tremendous success and we hope that you will plan to attend. Tour will be conducted from 11 – 3:30 and tickets for the fundraiser are $15. Rain date is October 11. The Friends of the Fall River Library, in conjunction with the Fall River Street Tree Planting Program, will be screening the film The American Elm: Majestic, Imperiled, Renewed from 7:00 – 8:30PM at the Main Library. FOG Board Member Mary Ann Wordell will provide a brief introduction. Light refreshments will be served. Artists and Fall River Natives Jim Charette and Mark Delisle present Boneyard, a series of paintings, prints, photography, music, video and more inspired by Oak Grove Cemetery. The gallery opening will be from 6-9PM at the Cherry & Webb Gallery, 139 South Main Street. Jim and Mark grew up on opposite ends of Oak Grove and attribute the formation of their life-long friendship to their old “stomping grounds”. As such, this cemetery holds a special meaning to both Jim and Mark. Jim and I have been discussing this event for well over a year now and both artists have generously agreed to donate a portion of the profits from the sale of their artwork to the Friends of Oak Grove. Please mark your calendar and consider attending this event and support these two local artists.